Krunal Pandya and Bhuvneshwar Kumar dismantled the New Zealand top order, reducing the home side to 50-4 after 7.5 overs. 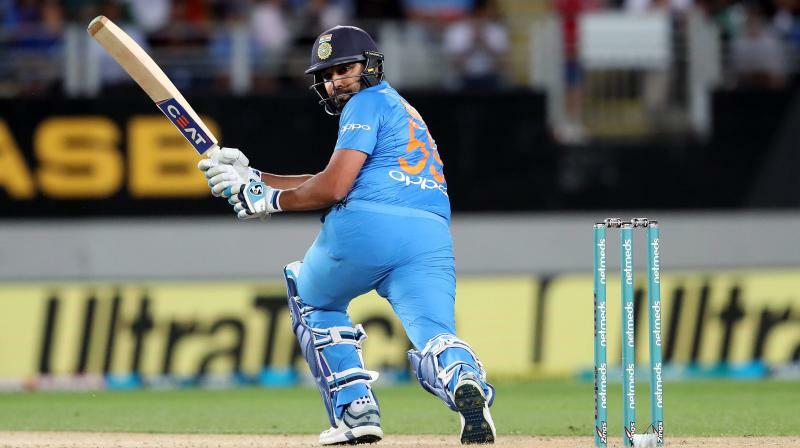 Auckland: Captain Rohit Sharma dashed a half-century from 28 balls and Rishabh Pant made an unbeaten 40 as India beat New Zealand by seven wickets in the second Twenty20 to level the three-match series at 1-1 on Friday. New Zealand won the first match by 80 runs on Wednesday. The final match is on Sunday at Hamilton. Left-arm spinner Krunal Pandya bowled an outstanding four-over spell, taking 3-28 as India contained New Zealand to 158-8 as it batted first after winning the toss. He was man of the match. Sharma set up the India run chase in a 79-run partnership for the first wicket with Shikhar Dhawan, who made 30 from 31 balls, and Pant saw India home in an unbroken 44-run partnership for the fourth wicket with Mahendra Singh Dhoni, who made 20 from 17 balls. India reached its winning target with seven balls remaining. "I was very pleased with the way we bowled to start with and then it was very clinical with the bat as well," Sharma said. "Something like that we were expecting. We've got quality in our side. It's just that we didn't execute our plans in the first game and we learned from our mistakes. We executed those plans in this game and we got the reward for it." New Zealand fell well short of the total it needed to have any chance of beating India on Eden Park, where short boundaries make defending any score extremely difficult. Colin de Grandhomme raced to a maiden T20 half-century from 27 balls in a 77-run fifth-wicket partnership with Ross Taylor (42) which revived the New Zealand innings. But Hardik Pandya removed de Grandhomme, and Khaleel Ahmed took two late wickets to ensure New Zealand fell short of an adequate total. New Zealand needed early wickets but Sharma and Dhawan denied them, knocking off almost half of India's target inside the first 10 overs. Sharma reached his 16th T20 half-century from 28 balls with three fours and four sixes. He was out immediately afterwards, caught in the deep by Tim Southee from the bowling of Ish Sodhi. India stayed ahead of the run-rate, and wicketkeeper Pant saw India home in a superb partnership with his mentor, Dhoni. Dhoni came to the crease to an enormous ovation from the crowd of 30,000, almost two thirds of whom were India fans and most of whom had come to watch Dhoni in his last tour to New Zealand. The pair came together when India was 118-3 in the 14th over and saw India home in the 19th over when Pant struck a four down the ground off Scott Kuggeleijn.